The course at Glen Brook is one of the oldest golf courses in the Poconos. It is a gently rolling course that offers a great variety of holes to play. With scenic mountains in the background, it is a sporty, never boring course to play. Glen Brook brings water into play on five holes and has relatively small greens. If you are tired of billiard table course (long flat and uninteresting) then Glen Brook will rekindle a zest for real golf. There's a challenge on every hole, both for the high and low handicapper. Although open to the public, the course and the John Stroud House clubhouse have a country club feel which golfers appreciate. The John Stroud House offers twelve beautifully appointed guest suites which are available year-round as well as cocktails, dining and banquet facilities. 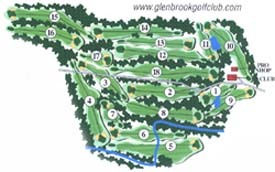 Glen Brook offers a variety of different memberships with varying annual fees. These annual dues usually include greens for the season, reduced cart fees and preferred starting times. Glen Brook Golf Club is located in the beautiful Pocono Mountains just 90 minutes from New York City.